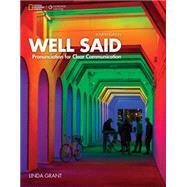 The Well Said series is designed to improve the pronunciation and communication skills of beginner to advanced students from all language backgrounds. It offers a clear course plan covering the essential areas of pronunciation, including stress, rhythm, and intonation--features that research shows help students the most. Additionally, there are over fifty pages of supplemental activities focusing on consonant and vowel sounds. This level of Well Said introduces the most important pronunciation features at an intermediate to advanced level. A free Website for teachers and students includes the full audio program.